I usually like to check the Alberta Government websites, monitoring the snow pack in the mountains and the rate of flow in the Elbow River, in late May. Their monitoring provides a guide to predict the likelihood of a flood in June. That is when floods can occur, between the 7th and 25th of June. Traditionally, that is when most of the snow in the mountains melts and we can get heavy rain events. We’ve had some doozies. They said the 2005 flood was a, “flood of the Century”. That was until the 2013 flood that had no precedent. It was bigger and more destructive than any other. Now, five years later, we’ve almost recovered, although there are several empty commercial spaces in the malls and two of our fine restaurants are gone forever. Still, life goes on. 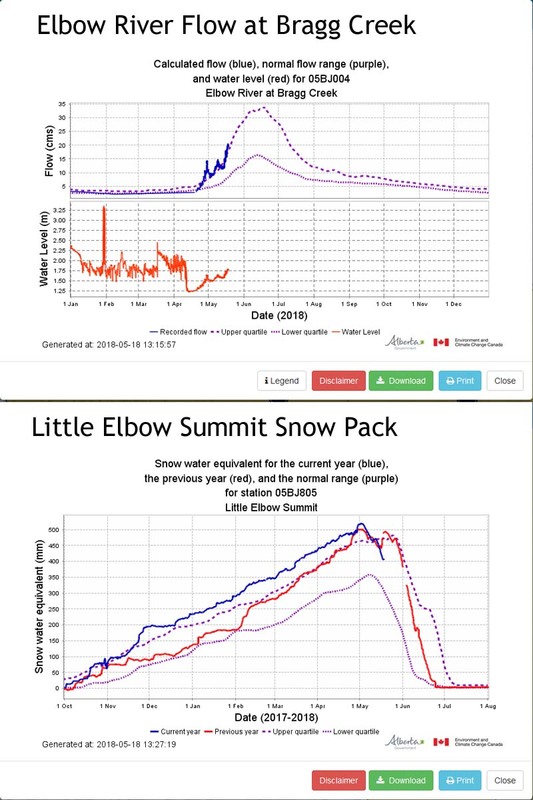 These graphs show the river flow in the Elbow River at Bragg Creek and the depth of snow at the Little Elbow Summit monitoring station. They are normal, a bit on the high side, but, based on my experience, nothing to worry about. There is still a lot of snow in the mountains, but unless we get a deluge of rain, as we did in 2013, it seems unlikely we’ll get a flood that hurts.